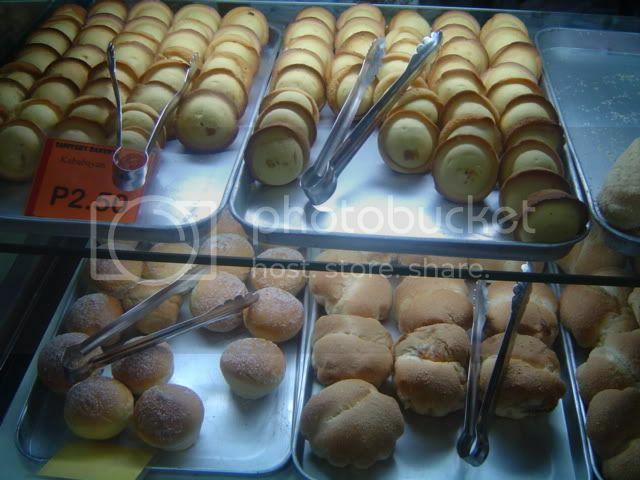 Every locality in Manila is teeming with bakeries and homegrown eateries. You can’t miss this one. Before donuts, burgers and fries made it big as ‘pig-out’ food, there were kababayans. I grew up having a feast on these. I tried searching in Google why it’s called that – kababayan. Didn’t find any. The English word for it is compatriot. It’s actually a muffin, plain muffin – just flour and eggs, sugar and a little vanilla flavor. I can only guess, perhaps back then, it’s a favored merienda for most Pinoys and a favorite pasalubong for relatives living in another country. Hence, kababayan. Back then means people twenty five years and younger might not know it is called such. Grab some, it’s nice to try once in a while the uncomplicated taste (not to mention it’s very affordable) of bread and pastries sold at the nearest bakery in your neighborhood. I LOVE Kababayan! I remember asking our grandmother to have it served for merienda. She would have it bought from the neighborhood bakery for about P2.00 each (not sure baout the price). I loved biting into those warm breads. Mmmmm. It transports me back to my childhood. This post is making me crave for it now!